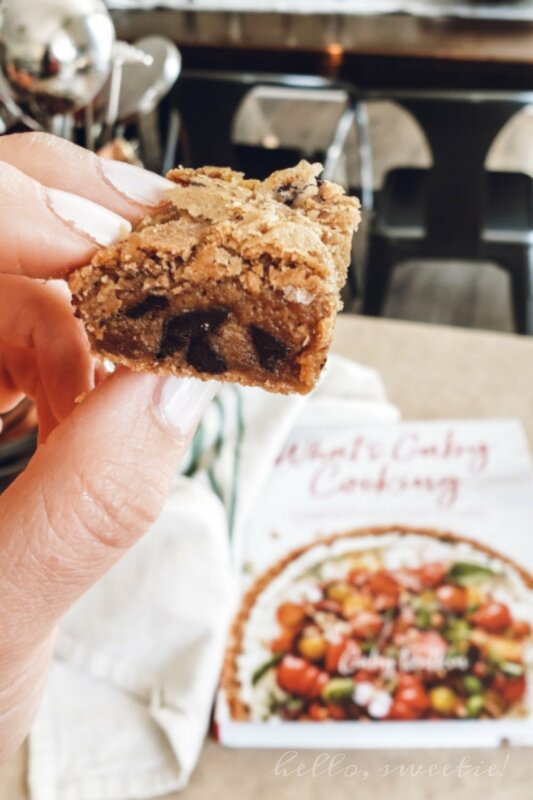 Brown Butter Chocolate Chip Cookie Squares — Hello, Sweetie! It's been a frozen tundra across the nation pretty much, but here in upstate New York it is especially cold! My kids have had off from school the past 2 days because the windchill brings temperatures to -25°! Subzero temperatures outside mean we mean finding extra ways to warm up inside, like playing games by the fire and baking lots of yummy goodies. 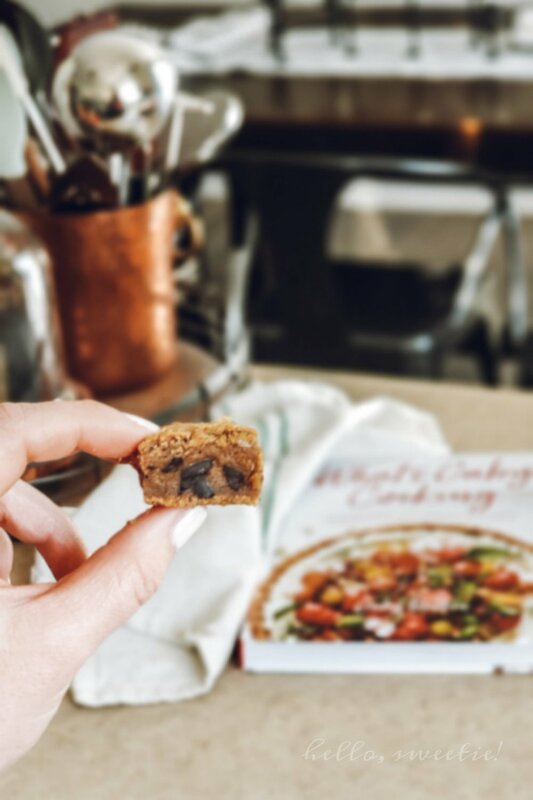 We whipped up a batch of Gaby Dalkin's Gooey Chocolate Chip Cookie Squares, and my kids went nuts! I have to admit, they weren't the only ones! My husband and I both indulged more than once as we walked by the domed cake plate throughout the day. I think her recipe is perfect but I did go an extra step and brown the butter. I truly believe it adds more of that toffee/carmel flavor that I adore. I also used dark brown sugar instead of light, decreased the amount of vanilla just a bit and increased the amount of chocolate chunks. Additionally, I sprinkled a small amount of fine sea salt into the batter, instead of just sprinkling flakes on top. However, I followed her baking instructions to "T" and did "NOT skip the two-hour cooling period, because there's carry over baking that will help everything firm up." I pre-ordered her cookbook when it came out last year and had been pleasantly surprised with every recipe I make! It's filled with accessible yet inventive, colorful dishes that are truly "everyday California food". And if you don't know what that means, take one look through the beautiful collection of photos and it all becomes very clear; casually impressive, flavorful & seasonal. It's what every Upstate New Yorker needs in their repertoire. Preheat the oven to 350ﾟ. Make a parchment paper sling in a square baking pan. I used 8 x 8" nonstick. In a medium saucepan, melt the butter over medium-low heat and keep a watchful eye on it! It will start to get brown at the bottom. This is a good sign but don't let it burn. With a wooden spoon scrape up the bottom and till it take see a light caramel hue, then you know it's done. In the bowl of a stand mixer, combine the browned butter and brown sugar, beat with paddle attachment for one minute. Once it's combined, add the eggs and vanilla. Scrape down the sides and mix for another 30 seconds. In a large mixing bowl, whisk together the flour, baking powder, baking soda and 1/4 teaspoon fine sea salt. Slowly mix in the dry ingredients into the sugar batter. Once it's just combined, stir in the chocolate chunks. Spoon the batter into the parchment-lined baking pan and spread to the edges with a spatula. Sprinkle the Maldon sea salt flakes on the top and bake for 30 minutes. It will be golden brown, slightly dry to the touch and have the tiniest jiggle in the center when gently shaken. Remove from the oven and place on a wire rack to cool for at least 2 hours before cutting. Like Gaby says "if you want to speed up the cooling process, transfer to the fridge for 30 minutes." Our garage is SO cold, we just put it in there for a 1/2 an hour! Cut into squares, snuggle up and watch the smiles spread! Original recipe from What's Gaby Cooking , by Gaby Dalkin.